« Awesome Support from The Next Generation! These guys sure chewed up our dill and fennel! But I suppose it was worth itâ€¦â€¦now, Iâ€™m wondering where they ended up? They’re back home Jacqui 🙂 I was lucky enough to capture a photo of this black swallowtail just as his wings were drying. This entry was posted on Saturday, June 2nd, 2007 at 3:30 pm	and is filed under Garden. You can follow any responses to this entry through the RSS 2.0 feed. You can leave a response, or trackback from your own site. Wow, I never saw any cocoons for all those caterpillars on our plants…….thought they all ran away. I’m glad you captured this. Now I can say that it was really worth it, not having any dill for the last few weeks. 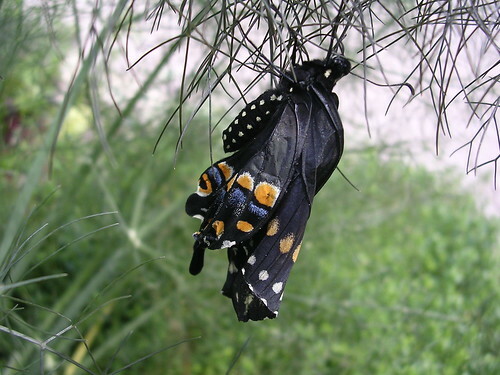 The Black Swallowtail is the most beautiful thing. I think it’s my favorite of all the butterflies.